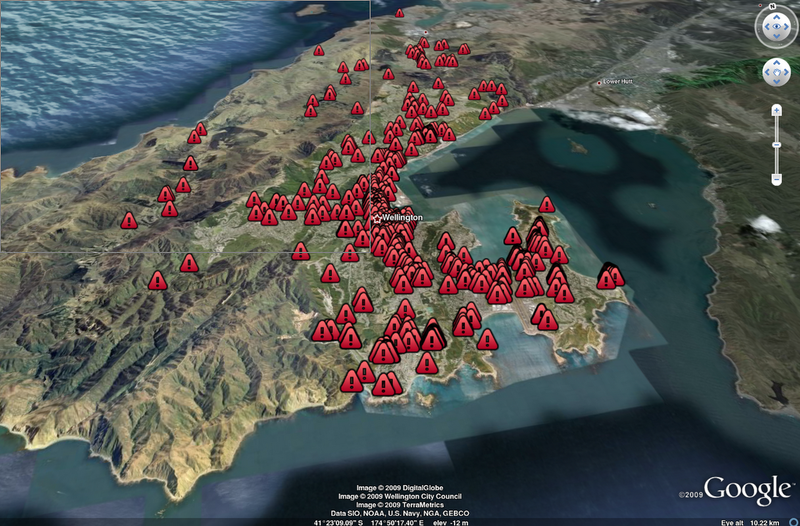 Reading this article about Wellington Hazards just makes me want to plot it on a map. 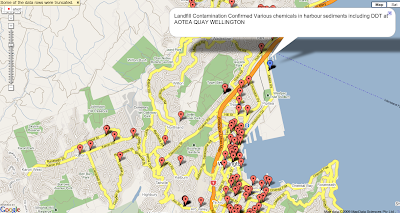 It took a while, but here is a map of Wellington Hazards / Contamination. 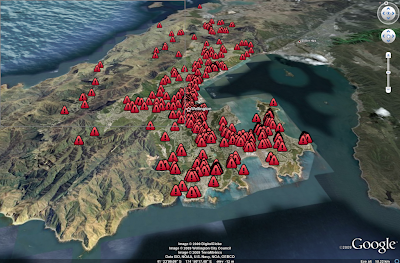 Below is a screenshots of the hazards on Google Earth and Google Maps (Google Earth shot nicely prepared by Cameron). Let me know what do you think? Read on after the jump for hyper-technical explanation of how I made the map. We can now geocode, using the helpful spreadsheet geocoder (instructions here). The only limitation was that only 100 addresses can be geo-coded at one time. But that’s fine as I only have 592 addresses. Now here is the tricky bit, there is no good way to get items from a spreadsheet onto a map. The best way I could was use KML. I used the Spreadsheet Mapper v2.0, but it was far too painful with the browser locking with just 600 rows. Here is the resultant spreadsheet: http://spreadsheets.google.com/pub?key=tXlYA3d_eh42qOboocs8zug&output=html. I will most likely use PostGis and the asKML function next time.